This far north, an avocado plant provides reliable entertainment and, less reliably, the makings of guacamole. The entertainment doesn’t compare with the excitement of a car chase on the silver screen; it’s slower but very engaging. Despite being plants of warm climates, avocados are frequently raised by us northerners, as houseplants. I could have planted the pits in potting soil in a pot, but would have missed out on root entertainment. So I stuck three toothpicks into and spaced evenly around each pit so that the pits could be suspended in a beaker with their bottoms — their fatter ends — sitting in water. Taking a thin slice off the top and bottom of the seed, which I did, reputedly speeds germination. Roots typically sprout before the tops show any sign of growth. Avocado houseplants are so common that probably none of the above is new information to most readers. I’m embarrassed, then, to admit that my two plants have faltered in their growth. One of them sent a sprout upwards after its roots were a couple of inches long. That sprout has dried out and, of course, ceased growth. I noticed a slime surrounding the root of the other pit. This pit was very slow to sprout, and my guess is that there’s some bacteria attacking the weak growth. I ascribe both failures to growing conditions which, here, indoors, are a far cry from the mostly warm, humid climes avocados call home. Mine sit near a window, experiencing wide swings in temperature in a room heated with a wood stove. Starting new plants in spring should bring better luck. I did get to effect and observe apical dominance on one of the plants. More benign than it sounds, apical dominance is the tendency for most vigorous growth from a plant’s uppermost buds, those either at the ends of branches or spatially at the highest points. That vigor comes from suppression of buds lower down by auxin, a plant hormone that is produced in the uppermost buds and transported down the stem. Lopping off the top of a stem stops hormone production (temporarily, until the new higher buds start making it) so lower buds grow as they let go of their inhibitions. The taproot growing from one of the avocado pits was threatening to bump into the bottom of the beaker so I pinched off a half inch of its tip. The effect was a mirror image to what happens with branches: within a few days, branch roots began to develop. Very entertaining. 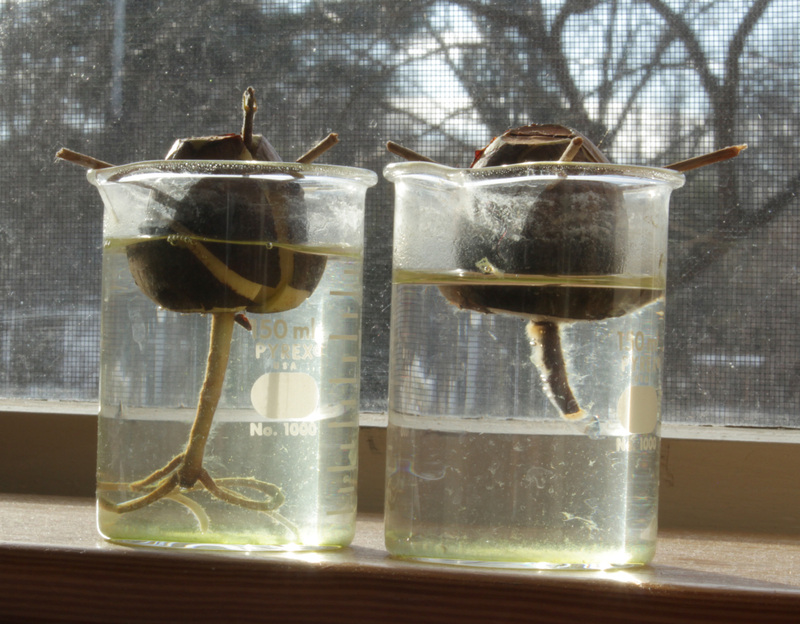 An avocado sprout typically shows strong apical dominance, developing into a gawky plant with a single, upright shoot. Cutting the growing top back by a few inches induces branching and makes for a prettier plant. More than beauty, I’d like fruit from my avocado plant. Under good conditions, such as in the ground in Florida, a pit would need 8 years or more before it became old enough to bear fruit. And then, said fruit might not be of best quality because the seedling would reflect whatever jumbling around of chromosomes occurred when the female flower that gave rise to the fruit that begot the seed got dusted with pollen from a male flower. For quicker bearing and more reliable good taste, cloning is needed, in this case grafting a branch from a tree known to bear good-tasting fruits onto the young seedling. Bearing, then, occurs within 3 or 4 years, and the fruit should be identical to the mother plant from which the stem for grafting was taken. Not so fast, though. You need two varieties for cross-pollination, and avocado has some pollination quirks. Still, my plan is to get new pits sprouting, and once their stems are large enough to graft, to get scions for grafting. Years ago, I did all this and got flowers but no fruit. I’m hopeful, this time around, to be making guacamole within 6 years. The time is drawing near for some real gardening, which could start with pruning. I’ll be putting apical dominance to work on some young fruit trees — each a mere “whip,” single, vertical stem — planted last year. Shortening the main stem will induce side branches that will eventually become the permanent scaffold limbs of these plants. The more severely any stem is shortened, the fewer and the more enthusiastic the sprouts from the buds lower down. 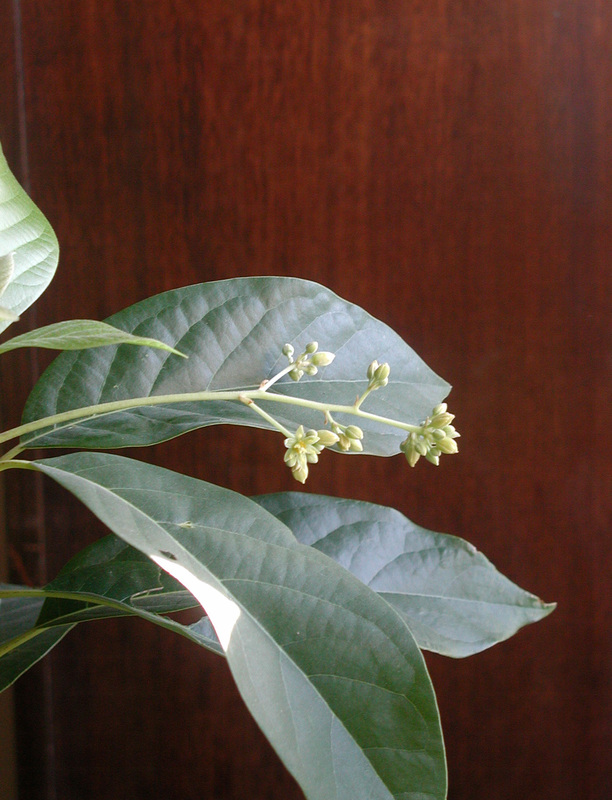 This entry was posted in Flowers, Fruit, Gardening, Houseplants and tagged apical dominance, avocado, houseplant. Bookmark the permalink. Trackbacks are closed, but you can post a comment. I bought an avocado “Day” from Logees several years ago. It is grafted plant that bears within 3 years according to Logees website. Te plant is healthy, yet I have not seen large flowers(at lest like the ones your picture shows) or fruit, obviously. Does this also need a second clone to cross pollinate? The flowers are actually small, but very numerous. Mostly, avocados need cross-pollination from another variety. ‘Day’ allegedly does not. I had a huge avocado plant in Maine, but when I moved to NY it became very sad and so was composted so it could move on to its next life. It never flowered but it could have grown tree size in our Maine house. I loved its large, shiny leaves. Here, during my migration in Florida, I cannot bear to throw an avocado pit into the trash so I toss them in the gardens of my rental even though I think I am a bit too far north for avocados – at least they return to the earth. Interesting about the grafting. I wish you the best avocados ever. You are very patient! I saw your interview with Joe Lamp’l on “Growing a Greener World.” Your garden is beautiful. 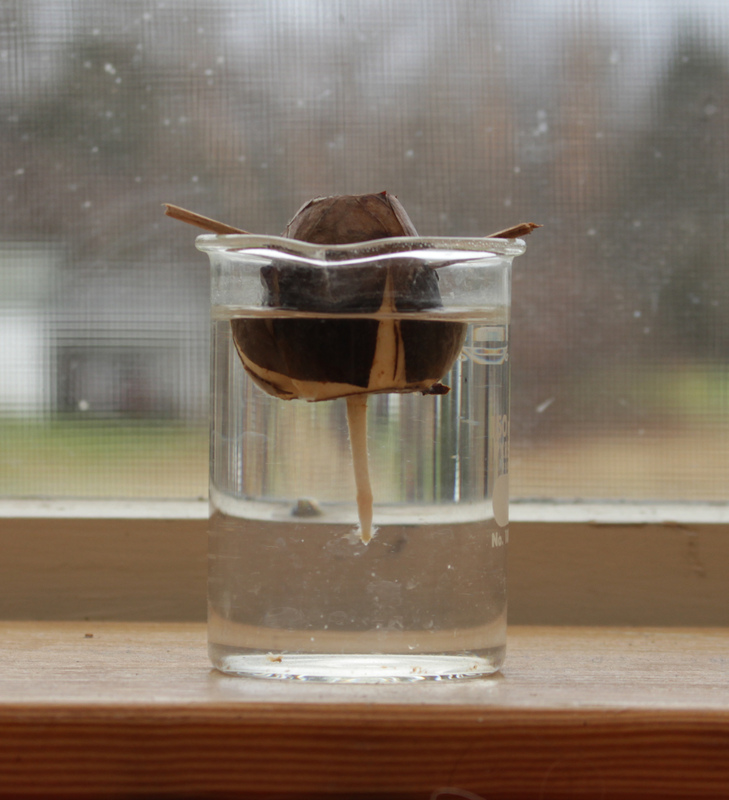 My kids and I are going to sprout our two avocado pits on our window sill today. I hope they’ll be as successful as your plants.